Angel „Pocho“ Gatti (1930-2000) from Buenos Aires was an outstanding pianist, arranger, conductor and composer. He worked mainly in Italy during the 1960s and early 70s. With his orchestras, that included Italian jazz masters like Gianni Basso, Giorgio Gaslini or Oscar Valdambrini as soloists, he accompanied American stars like Frank Sinatra, Sarah Vaughan or Johnnie Ray. Already during the 1950s Pocho Gatti frequently played at the „Bop Club Argentino“ in Buenos Aires with world reknowned musicians like Lalo Schifrin, „Chivo“ Borraro or Gato Barbieri. Later on he recorded with Giorgio Azzolini in Italy. At the end of the 1960s his Milan Big Band, the "big orchestra Angel Pocho Gatti", belonged to the most famous European ensembles. Subsequent productions of the 1970s include prestigious work for Quincy Jones, collaborations with Gerry Mulligan and Astor Piazzolla and plenty of work for various Italian sound libraries. Music and motors have always had something in common. For many people, both give them the same emotions considering that a motor that is working perfectly often is compared to a song, a sound, music. This common ground is certainly strengthened by the arrival of the turbo which - together with its sibilance - has brought motors and music yet nearer together. 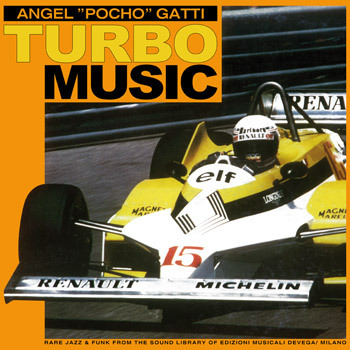 This album was brought to life with this idea in mind: a musician, Pocho Gatti, is fascinated by the turbo because of its name, its noise, and its power to immediately become a myth. He presented the idea of composing “Turbomusic” to Renault. The answer was immediate: yes, please! Yes, because the talent of this artist comes with an enthusiasm that gives you the sense that this will become a success for sure. Pocho gets his inspiration from the Formula 1. Especially so in the past from people like Jabouille and Arnoux and today from Prost. He has also looked into the new cars that have been widening the Renault Turbo product range since autum 1981: the Renault 4 Alpine Turbo and the 30 Turbodiesel. The music and the arrangements have been written especially for this record. For Angel „Pocho“ Gatti music certainly is not a mystery. As musician, born into an artist family, Bach, Chopin, Dvorak and Ellington were no strangers to Gatti who started playing the piano before he started school. His father was a violinist at the Symphonic Orchestra of Teatro Colon in Buenos Aires, and Pocho's first notes were Argentinian. But as Toscanini was in need of 10 musicians for the NBC Symphony Orchestra, Angel followed his father to New York in 1940, when he was just ten years old. His new destination was „Junior High School“, where he became part of the band, though as clarinetist. During the years, this reed became his main instrument and he kept on playing it at the Symphonic Orchestra of the University, which was directed by Leonard Bernstein. In 1949 Angel Pocho Gatti wins a competition and enters the NBC. He stays there for two years before he is called into military service for 1,5 years. Pocho returns to New York, where he dedicates himself to the piano, writing arrangements and ballets until he gets to know Nelson Riddle in California who is looking for a pianist for Frank Sinatra. And so - everytime Sinatra comes to Europe - the young Pocho serves „the Voice“ until 1961. In Paris he is taught harmony by Nadia Boulanger, in Italy he works for the RAI, and plays concerts all over the old continent. In 1973 he returns to the USA where he is taught orchestra conducting by Zubim Metha at the Conservatory in Los Angeles. He returns to Italy in 1975 where he conducts orchestras, writes arrangements, suites and records classic, jazz and folk concerts. Today he teaches harmony and composition at „Centro Istruzione Musicale“ in Verona. 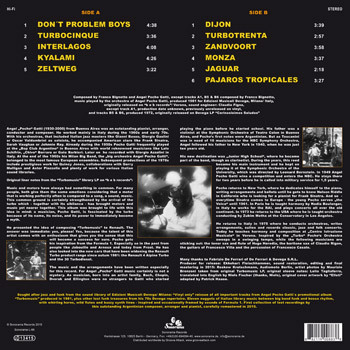 Inspired by the „Turbo“ Pocho's Orchestra sweeps in a swinging tempo, while the following musicians are sticking out: the tenor sax and flute of Hugo Heredia, the baritone sax of Claudio Rigon, the guitars of Francesco Villa and the percussion of Francesco Casale. Many thanks to Fabrizio De Ferrari of De Ferrari & Devega S.R.L. original cover artwork by “Elleti” adapted by Patrick Haase.